Flash My Brain - Learn Chinese with character, pinyin, and pronunciation flash cards. 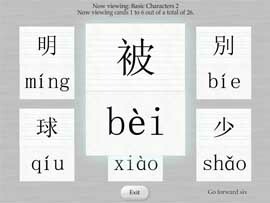 Learn Chinese with character, pinyin, and pronunciation flash cards. Flash My Brain helps people learn Chinese. Whether its pinyin, traditional characters, simplified characters, or pronunciation, Flash My Brain can make flash cards and help you use them to study Chinese. Flash My Brain is all online, so you can start studying at the computer lab at school and finish in your room at home. Flash My Brain will pick up right where you left off. Flash My Brain features a seamless automatic pinyin feature. Tired of making vocabularly lists with pinyin like wo3 bu4zhi1dao4? Flash My Brain automatically converts these expressions into proper pinyin as you type. Now you're ready to print them out or play games with them! 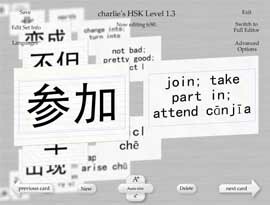 Studying Chinese characters is the perfect application of flash card learning. Flash My Brain is an excellent tool for learning and teaching Chinese. Flash My Brain can make talking flash cards. 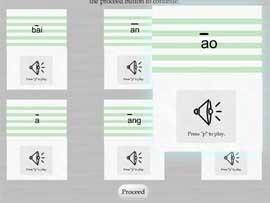 If you're a teacher or a native speaker, record your own pronunciations and make talking flash card stacks and share them with your students. 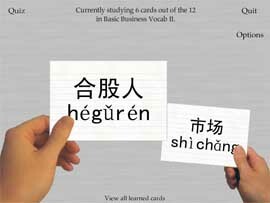 Buy Flash My Brain for $29.95 and watch your Chinese level tigao with Flash My Brain flash cards!